A Problem has popped up in London: a plague of violent ghosts have overrun the city. However, only kids have the ability to see them--and deal with them. They work for Psychic Detective Agencies to handle the ghosts. 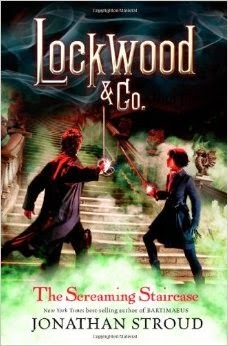 Lockwood & Co. is one such agency, though rather ramshackle and tiny. Plus, they are not even supervised by adults. Fifteen-year-old Lucy has just been hired on, but the first job the company tackles goes horribly wrong. The only way to save the business is to work on Combe Carey Hall, the most haunted building in England. Will they be able to survive, let alone eradicate the ghosts? From page 1, this book was AMAZING. And I don’t go all caps for just any book. This was so well written that I was jumping in fear every time someone interrupted me. I don’t even know what else to say about it, you just have to go read it for yourself! Unless you don’t like ghost stories. Because that would kind of ruin it for you.